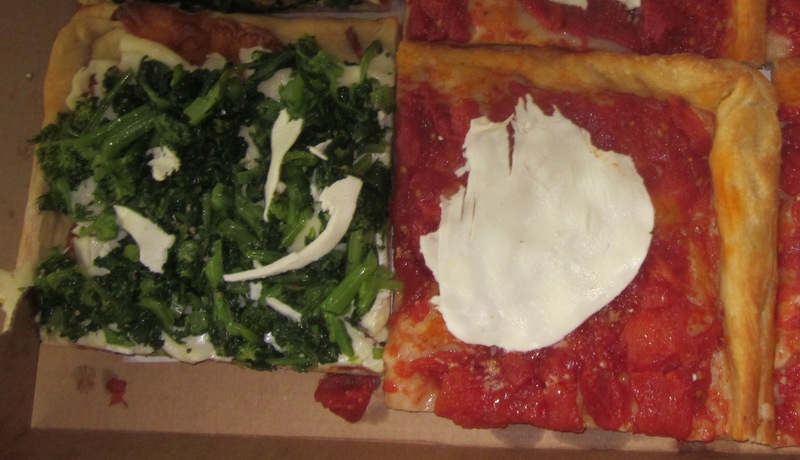 In the previous installment of “Today’s Slice,” here on Fried Neck Bones…and Some Home Fries, I visited Full Moon Pizza on Arthur Avenue for the Spinach and Artichoke Slice ( see Artichoke and Spinach Pizza). In that post I mentioned Cafe al Mercato and the mini pies and square slices they sell from their booth inside the Arthur Avenue retail market. 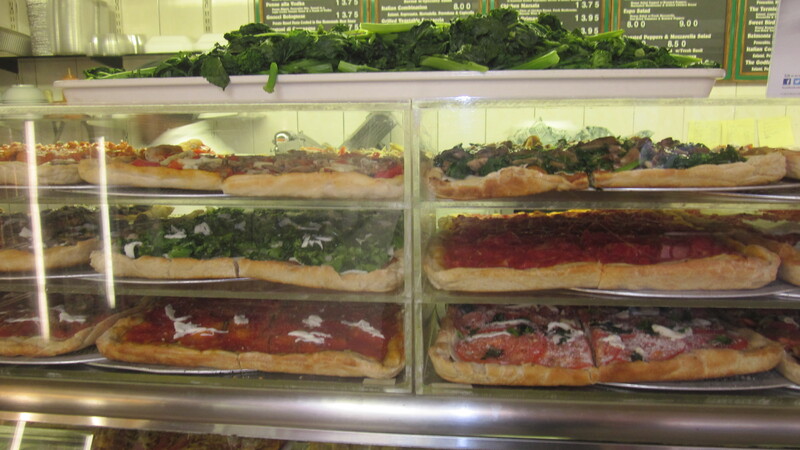 The preferred slice at Cafe al Mercato is, undoubtedly, the broccoli rabe slice. And I’m not alone. When I last visited, the broccoli rabe was piled high on top of the booth counter in anticipation of being applied to many thin, square slices. What makes Cafe al Mercato’s broccoli rabe slice so good starts with the broccoli rabe, cooked tender, but not overdone, topped with slivers of fresh mozzarella. All of this is applied to a thin, yet durable, crunchy crust cooked in a traditional “slice” pizza oven as opposed to a fancy, imported wood Neapolitan stove. 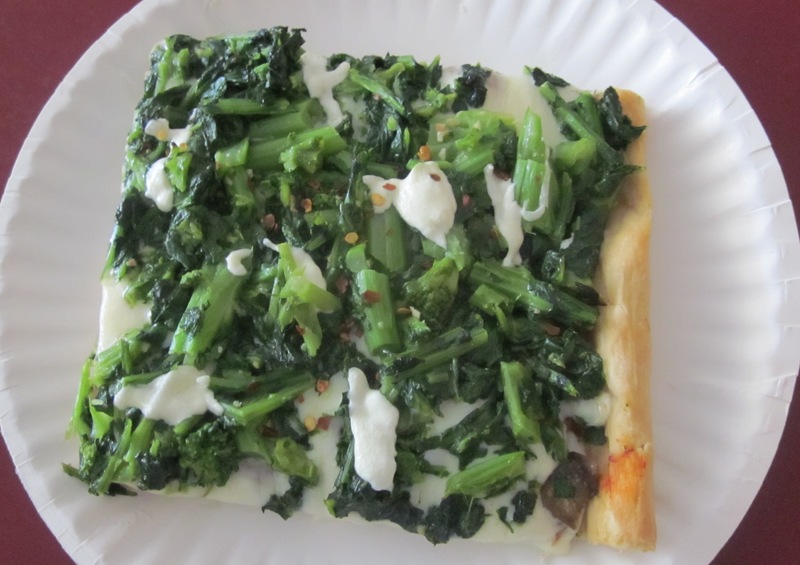 If you have an aversion to broccoli rabe or anything green, the simple, “regular” slice with tomato sauce and mozzarella will bring back memories of “homemade” pizza. And when I say homemade, I mean what my grandmother used to make in an old cookie pan, rolling out the dough, topping with her sauce and adding a few slices of Polly O Mozzarella. All of it cooked in her basement oven. It wasn’t pizza as we were used to from the pizzeria, but we never complained. The unbeatable combination at Cafe al Mercato.